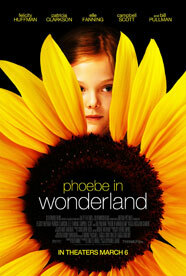 'Phoebe in Wonderland' is a whimsical tale of a young girl (Elle Fanning) who can't seem to follow the rules. Perplexed by her inability to get along with the rule-obsessed world around her, Phoebe seeks enlightenment and comfort from her unconventional drama teacher (Patricia Clarkson), even as her brilliant but anguished mother (Felicity Huffman) looks to Phoebe for inspiration. 'Phoebe in Wonderland' explores a young girl's self-discovery and her journey to find acceptance of her individuality.